Hosted DBaaS in a dedicated VPC. Supports advanced capabilities like Active-Active Geo Distribution, Redis-on-Flash, Search. Graph or Document data models . Can be migrated to your own cloud account. Price per shard. Starts at $1.134/hr. FIRST $100 FREE! Enjoy the seamless scaling, high performance and cost-effectiveness of Redis Enterprise databases inside your own secure cloud. Start by provisioning it in a few simple steps. Choose RAM or RAM +Flash deployments based on your performance/cost profile. 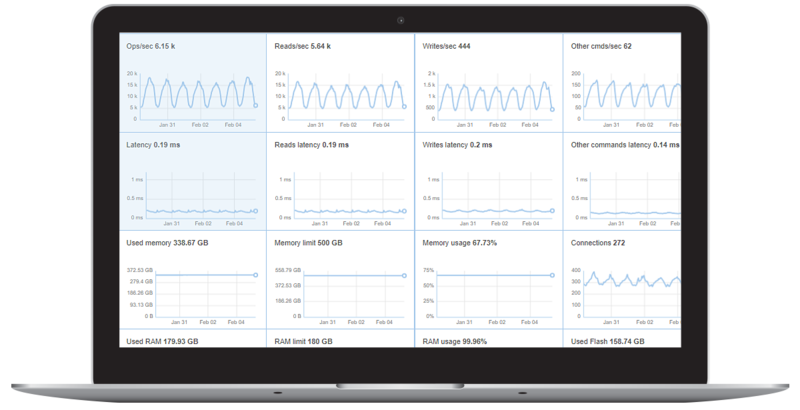 With tiered access to RAM and SSDs, Redis on Flash delivers extremely high performance with less demanding infrastructure costs. Scale your datasets up and down seamlessly, with an in-depth view into key operational metrics, without any downtime. Built-in data persistence, durability and high availability ensure a fail-safe operation. Achieve continuous diskless in-memory replication and instant automatic failover across racks/zones/datacenters with the click of a button. Protect your Redis databases with automated,UI-enabled replication, persistence, backups and disaster recovery. Efficiently replicate Redis databases between Redis Enterprise in VPCs or in your own private datacenters or across cloud regions, with built-in compression, diskless replication and WAN optimization technologies. Create multi-region, multi-cloud or hybrid (on-premises and cloud) Redis Enterprise deployments that accelerate your applications and require zero time to DR.
Gain instant alert notifications for exceeding memory and connection limits, or crossing latency, high throughput or low throughput thresholds. Reap benefits from the tremendous operational expertise of the team that develops and maintains open source Redis and the professionals who manage hundreds of thousands of Redis databases daily. All your resources are constantly monitored as shown on our Status page. Enjoy our 24/7 support via online helpdesk or phone.